The 2018 Booster Days Medallion has been FOUND! Join in on the family fun! 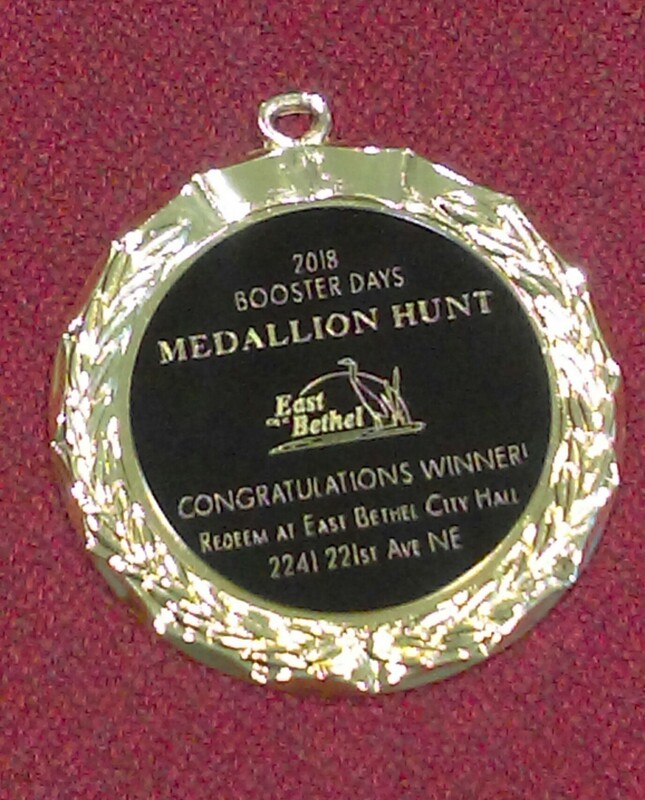 The Booster Days festivities will begin with the start of the citywide Booster Days Medallion Hunt. Enthusiasts in our area will scour the community for a chance to discover the location of the Medallion. Starting Monday, July 16, one clue will be released each day, until Friday, July 20. Each successive clue will narrow down the correct search area. The lucky participant who finds the Medallion will win a 4-pack of tickets to Valleyfair! 1. The Medallion Hunt will begin on Monday, July 16th, 2018. 2. No registration is required and the contest is free. 4. A new clue will be posted each subsequent day until the Medallion is turned in. questions will be provided. Questions will not be answered in any form. 7. The Medallion will not be located on private property or within any structure that is not publicly accessible. Trespassers to private property may be held legally accountable for their actions as the law states. 9. Searchers must not damage public property or violate laws/ordinances. For example: city parks close at 10:00PM. 10. The Medallion will not be located any higher than 6 feet off of the ground. 11. The Medallion will not be buried. verification. An announcement will be made on all clue-posting locations when the Medallion is found. the Park to accept the tickets, the finder will receive the tickets by mail within one week. be awarded via random drawing of attendees at the Movie in the Park event. 16. The decisions of the Booster Days Committee are final. Employees of the City of East Bethel, members of the East Bethel Booster Days Committee, and members of their families residing in the same household are not eligible to participate. New clues will be listed here as they are released. But it is not enclosed.